Welcome to "What's Actually Good," the column that looks at the good, the bad and the Loeb of the comics industry. Thankfully, mostly the good. In this issue, I go to thesauraus.com and type in "imaginative" in an effort to find more words to describe Grant Morrison and discover that Brian K. Vaughan can make even a Wolverine book touching. Go figure. The books in question? All Star Superman and Logan. All this and the usual nonsense. Escapeites assemble! 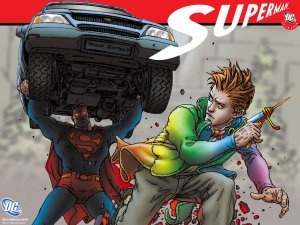 All Star Superman is part of the All Star range launched by DC in 2005, and like All Star Batman saw two of the hottest creators in comics come together to create their own unique and independent stories. However, unlike Frank Miller and Jim Lee's radical take on Batman (which has just took a turn for the awesome), Morrison writes Superman exactly as we love him. The series is now on its ninth issue in what is a planned 12-issue series, published bi-monthly. I hold Grant Morrison as something of a holy mastermind within the comics industry. His stories are complex, imaginative and steeped in a deep reverence for the characters and medium. He has written many Superhero books including my personal favorite, Animal Man, and most recently Batman, too. While it's clear he has a great love for superheroes, his own independent titles have become cult favourites. The Invisibles, We3 and The Filth enjoy both fame and notoriety from readers and critics alike, and no other writer has me more bamboozled with each issue. His books are always wonderfully complex and benefit from multiple readings and analysis. Each issue of All Star Superman tells a story loosely tied into the background of Kal-El's realization of his own mortality after a particularly nasty plot from Luther succeeds. He tells Lois who he is, tries to make amends with Lex, goes back in time to visit his dead pa one more time and more. The book imparts the Kryptonian with a sentiment of humanity and, in doing so, captures the essence of a good Superman story perfectly. The dynamic duo that is Grant Morrison and Frank Quitely first collaborated together with Flex Mentallo, Morrisons quietly powerful tribute to comics. Since then, they have enjoyed critical success in both superhero books such as New X-Men, JLA and more adult titles as well. Grant's imagination has found a perfect partnership with Quitely's stylish pencils. Frank manages to capture the iconic Superman look but still maintain a contemporary feel. The square jaw and curled lock of hair is there, along with the perfect physique and deep blue eyes. He seems imposing, sure, but also gentle and warm. This paradox is hard to capture, and is one of Superman's most endearing features. Quitely, while not your fastest artist, delivers within each issue a visual feast, coupled with magnificent colors from Jamie Grant. The appeal of Superman to your average reader is not what it used to be. Despite my efforts, it seems people prefer the darker or more realistic heroes, and often I have tried to impress the strengths and importance of the character of Superman to my friends, generally to no effect. Who could have thought all I actually needed to do was show them this book? Morrison knows what makes the character great, and the book is stuffed with every reason to love the big guy. This is perfect iconic Superman, imaginative, colorful and exciting. Grab the singles before the series ends. The 10th issue is due on March 19. No so recently, Wolverine found out about his past, removing one of the key features that made the character even halfway interesting to me. What Marvel have done now, instead, is opened the floodgates to new Wolverine stories featuring his mysterious background. While this appears to be a good idea, not much has really eventuated from it except the likes of the sub-par Wolverine: Origins and the odd story in his usual solo book. Thankfully, one of my favourite writers, Brian K. Vaughan, has stepped in with Eduardo Risso to help fill the void with Logan. Marvel has brought their biggest and baddest Canadian back to Japan with a single 3-issue mini-series, with the first issue becoming available last week. It tells of Wolverine returning to a newly remembered location in his past and reveals one of his earliest memories of tenderness. All, of course, superimposed on a background of violence and tragedy.